Click on image to read the article! I’m proud to announce my debut as a contributing weekly SoCal Focus columnist for KCET television’s website! 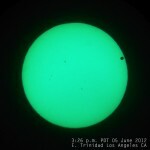 Today was the day of the long-awaited Transit of Venus across the face of the Sun. I made sure to get my errands done (like voting for Tuesday’s California primary election) before 3 p.m. so I can enjoy this astronomical event that won’t happen for another 105 years. This morning I addressed around 100 Los Angeles Public Library volunteers and staff on the virtues of volunteerism at a Volunteer Recognition Breakfast at the Pio Pico-Koreatown Branch Library. More on this at the CahuenGardeners blog! I’ve originally made this blog to document my community observations and activities, but I decided to spin-off my Cahuenga Library Botanical Garden posts into its own separate blog – CahuenGardeners. All my life, while driving, biking or walking along Fountain Avenue, I’ve always seen it: The image of a mustachioed old man on a wall with wavy, spaghetti-like white hair staring in a gaze towards the east. Today wasn’t only another Cahuenga Library Mini Clean-Up, but the one-year anniversary of the native plant garden at the Library. So I went out to European Baking Co. on the way to the Library on Santa Monica Blvd and got a small red velvet cake for the volunteers.